THE BALANCED FORMULA, SCIENTIFICALLY ENGINEERED FOR YOUR CAR’S SPECIAL NEEDS, LIFTS AWAY DIRT AND DEBRIS WITHOUT HARMING AUTOMOTIVE SURFACES. PACK CONTAINS 8 TABLETS OF 5 GRAMS EACH. 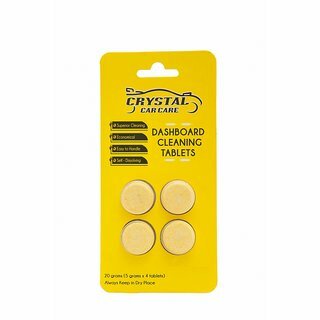 ONE TABLET GIVES YOU ONE LITER OF READY TO USE DASHBOARD CLEANER. 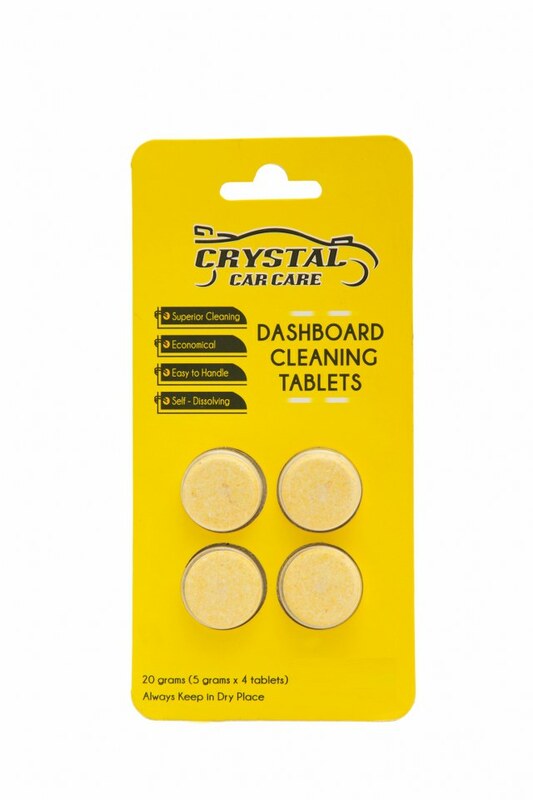 THE TABLET SHOULD BE DISSOLVED IN 500ML WATER FOR CLEANING STAINED OR DIRTY CAR INTERIORS. DISSOLVE ONE TABLET IN 500ML OF WARM WATER. THE SELF-DISSOLVING TABLET WILL DISSOLVE ITSELF AND YOU WILL GET THE READY TO USE CLEANER FOR YOUR DASHBOARD AND DOOR TRIMS. SPRAY DIRECTLY ONTO THE TRIMS AND WIPE WITH SOFT CLOTH TO GET CLEAN SURFACE. FOR STUBBORN STAINS OR DIRT, SPRAY AND LET CLEANER WORK FOR 30-40 SECONDS, THEN WIPE TO A CLEAN TRIM. USE MICROFIBER CLEANING TOWEL TO CLEAN AND FOLLOW WITH CRYSTAL’S PROTECTANTS.